Need a quote on an in ground or above ground pool in BC Canada? Complete the form below and get 4 quotes. 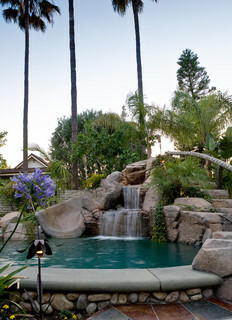 Today we will take a look at a few luxury pool water features commonly used in many backyard design projects. Keep in mind that many luxury pool contractors rates will typically range between $100,000 and $500,000. The biggest economic crisis in modern history saw many great pool contractors throughout North America moving onto other things. Sadly, this opened the door for many inexperienced builders to build so-called luxury pools. The amount of fine attention to detail that goes into building a custom pool to a high standard may go unnoticed to the average person but are easily detected by experienced pool builders. As always, you want to ensure that you are hiring someone that is capable of carrying out a project. Don’t just take the contractors word for it. If possible, check their references. While it isn’t a foolproof way of avoiding problems later on, it does eliminate a lot of doubts. Mediterranean Pool by Edmond Landscape Architects & Landscape Designers CAVINESS LANDSCAPE DESIGN, INC.
High quality pools deserve quality water features. 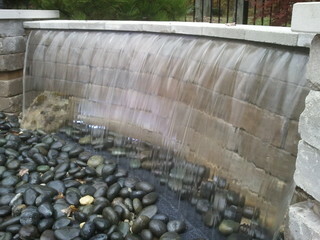 A common water feature for nature infused backyards is a custom rock waterfall. These are a staple in amusement parks around the world and for good reason. They look great, produce soothing sounds, and can transform a cold and boring yard into a warm and welcoming atmosphere. 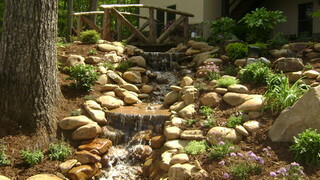 Rock water features are made in a variety of different ways. One method utilizes an internal bracing system with concrete GFRC panels tied on making the inside hollow. A concrete mud is used to seal the joints. One company that comes to mind is Neptune Panels which is a distributor in the USA. While strong, the concrete/fiber panels will still split down the middle if struck hard enough with a hammer. Rock molds for this method are often flat surfaced making this the easiest method to scale for fast projects. 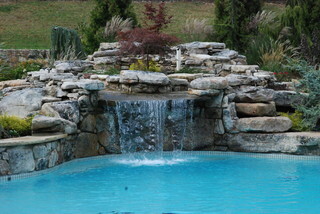 Another method of creating rock waterfalls for pools is through the use of concrete forming and shotcrete. This method often costs the most simply due to the amount of preparation, labourers, and materials used not to mention the ongoing maintenance to repair cracks, chips, and leaks commonly caused during the winter. This is the most common method of creating artificial rock water features simply because concrete pool contractors already deal with shotcrete. It does have the potential to look very nice in the hands of expert artisans. 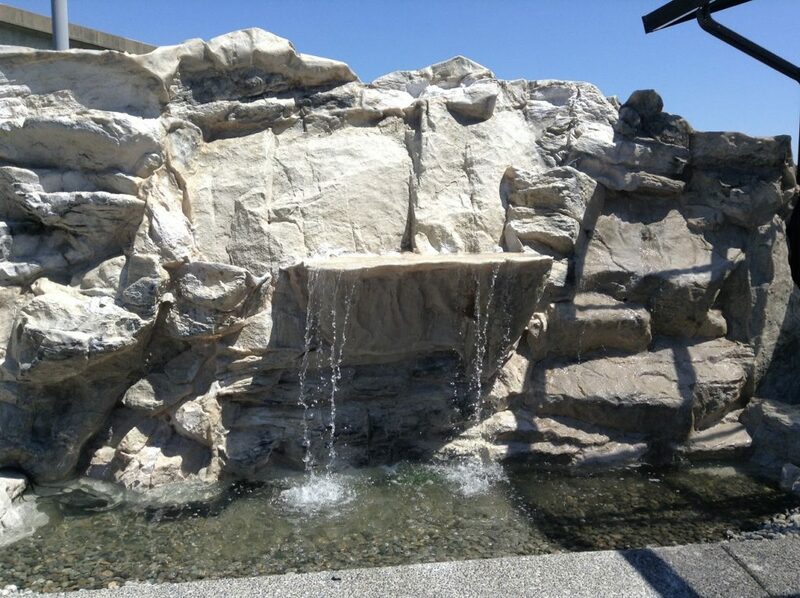 One method of creating a lightweight, cost-effective, and easily customizable custom rock waterfall or fountain is by using a blend of fiberglass and natural materials. This method is the least common for creating rock water features. WaterfallNow adopted this method simply because nobody else was doing it. The thickness can be adjusted depending on the application. While similar to the GFRC panel method, this method is different due to the rock texture which is a clone of the original rock face capturing deep grooves, and edges of real cliffsides. Attempting to recreate these patterns carved out of concrete would produce less than appealing results. Although it requires much more cutting, bending, shaping, and many hours of practice to get right, we find that it has the most potential. The cost can be 20-50% less than the other methods. This gives you two options. Firstly you can expect a cost of 20-50% less than what you would normally pay. Secondly, you can spend the same amount yet get much more bang for your buck. An example would be the option to choose additional lighting, spillways, or a larger sized rock. Does your backyard look more like a jungle than a townhouse complex? 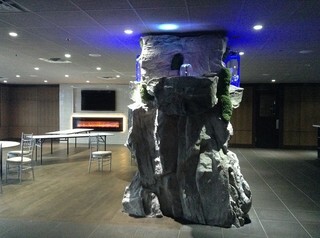 If so, a custom rock waterfall just might be your next big project. The sooner you start planning, the sooner you can enjoy spending time in your private oasis. 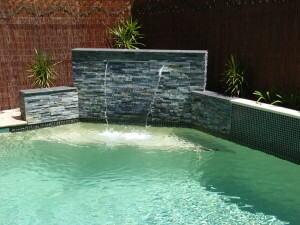 Laminar water jets are a commonly used water feature for modern pool designs. 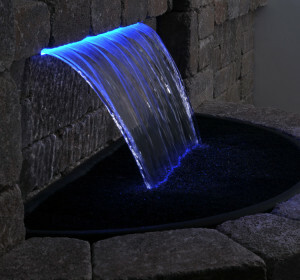 Some models can be programmed to change colors and turn on and off at different intervals creating a mini water show. 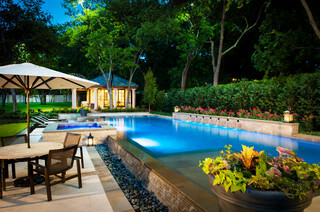 Contemporary Pool by Plano Pools & Spas Pool Environments, Inc. While these images do not properly show their effects, when a laminar water jet with LED lighting penetrates the pool surface, it also lights up the pool area with the same color of LED light used. 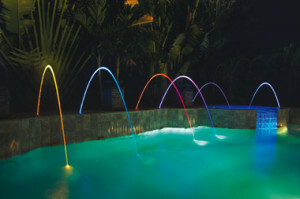 A blue LED laminar jet would light up the pool surface and cast a blue glow. 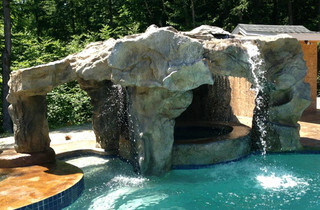 These water features can be used in conjunction with custom rock waterfalls or for clean modern pool designs as shown in the previous image above. 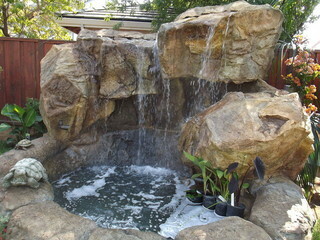 The more common black plastic waterfall pond kits are not common with luxury backyard pool designs. 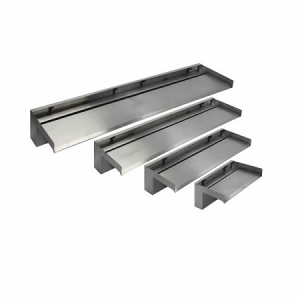 There are hundreds of different designs and even infinite possibilities if you contract a custom stainless steel fabricator. 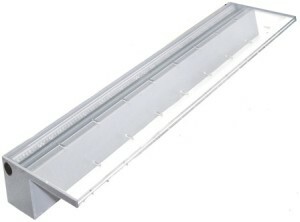 One of the most important things to include is a high quality LED light strip. 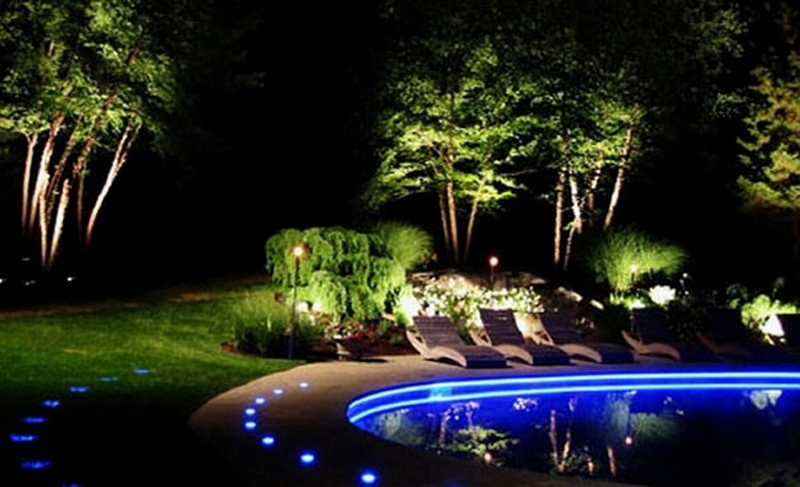 Ask any landscape designer what is the one easiest thing you can do to drastically improve the look and feel of a yard and they might mention lighting. At least from our own personal experience, proper lighting (underwater lights even) can make the biggest difference. The following image is an example of what a waterfall sheer might look like. It does not appear to have any LED lighting installed near the outlet however you can see the use of an anti-splash mat where the rocks hit the base. Now that you have no excuse not to know what to look for, why not head over to Houzz, Pinterest, or your local luxury pool water features specialists website and browse further ideas? 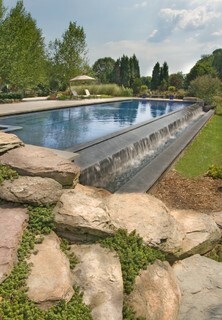 Planning a custom-built luxury pool with water features and would like a quote? Get in touch with WaterfallNow and ask about our new offerings. We will send an inhouse designer to the site (not a salesperson) to provide you with a solid quote as early as the next day. Our prices are fair across the board and considered to be the most affordable. Other worthy mentions: fountains, cobra stainless steel spillway, bubbler fountain, rain curtain (very ‘pretty’), rain effect water sheer, water overflow from basins. Did we miss something? Feel free to make a recommendation. Check out some of the hottest backyard pool ideas featuring grottos, pools, lazy rivers, and waterfalls. Whether you have a luxury pool or one made on a small budget, having a clean pool is essential. When it comes to pool maintenance, prevention is better than cure. Nobody wants to swim around in a disease ridden pool. Watch this video to learn how to keep the water in your pool crystal clear while also saving tons of money on pool maintenance. Have you considered upgrading your pool? WaterfallNow builds and installs artificial rock waterfalls for pools, LED lighting, and waterfall spillways/weirs/sheers. 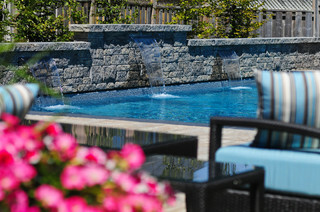 There are several dozen custom pool builders specializing in all things luxury pools in the Lower Mainland, BC, Canada. Materials used can range from vinyl, gunite, fiberglass and so forth. 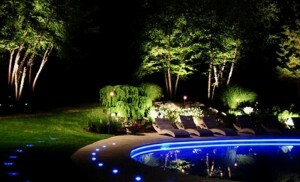 They are perfect for country clubs, swim clubs, hotels, residential, or commercial properties. You will need to speak with your local pool contractors who are familiar with the bylaw and other distinct requirements of that particular geographical location. Most pool buyers will get a quote and reach a decision 1-2 years later. Outdoor pools which are seasonal (exposed year-round) can optimized for low maintenance and maximum up-time. Hiring the right contractor who refuses to compromise quality for speed will often spare you from the headaches of having to redo a project. While most pools that you would consider to be nice will range from $30,000-$50,000, it isn’t uncommon for the cost of luxury pools to exceed $1 million dollars. In fact, when it comes to the homes of celebrities, most do. In some cases, we have even seen backyard pools, waterfalls, and water features cost more than the homes themselves. Custom pool designers can create infinity pools, perimeter overflows, tropical pools, salt-water pools, contemporary designs, freeform designs, custom spas, grottos, and much more. In many cases, custom pool designers either work alongside a loyal subcontractor who specializes in custom waterfalls but more often will use their own inhouse crew. Some will offer outdoor living designs such as outdoor kitchens, fire pits, landscaping, and more. Not matter who you are dealing with, even the best companies will not be able to carry out a proper job with an improper bid. Luxury pools, ponds, waterfalls, and landscaping projects are all reliant on the experience, and craftsmanship of the set of contractors employed for the specific task. No amount of a company’s reputation will ever change that fact. The key to success is in finding the company which has dedicated and loyal contractors working with the same company to stand behind their work. This is where you will see the best quality of work. 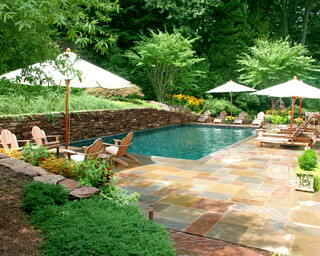 Ideally everybody should be on the same page from when the permits are approved to when you are swimming in your pool. 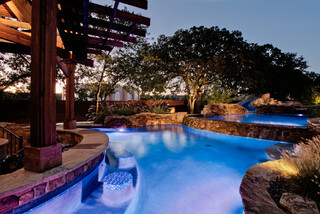 Eclectic Pool by Plano Pools & Spas Pool Environments, Inc. Traditional Pool by Plano Pools & Spas Pool Environments, Inc.
Do you have a dream luxury pool renovation project in mind? If so, feel free to contact WaterfallNow to explore potential options and view physical samples. The products we manufacture provides home owners with the most cost effective method of achieving extremely large waterfall features to compliment any pool or garden. 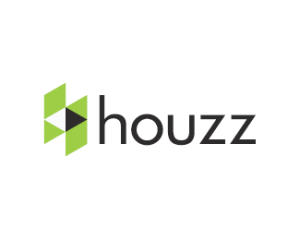 Lately I’ve been fascinated with the website Houzz.com. If you aren’t familiar with this website, it is one of the most popular sites along with Pinterest where homeowners, and contractors go to gather ideas, connect with others in the industry, and share their work. Here are several rock solid ideas that may help you decide on what type of waterfall water feature you personally prefer. This is a popular photo that many people have expressed interest in. It has been built to compliment and blend the surrounding landscape to create a natural effect. I really admire projects where the landscaper took the effort to make things as natural as possible. While some people prefer the insane overhangs that can be achieved using faux or fake rocks, this method is very cool and I think it would look even nicer with the addition of custom lighting colors. Overall an impressive job with great attention paid to detail and no stone out of place. 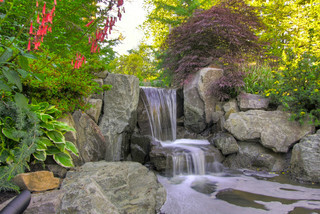 This is a great shot with a beautiful natural stone waterfall. The two larger boulders alongside the spillway combined with a well designed lip makes for an impressive sight. I can only imagine how nice this particular waterfall sounds. This double tiered feature would definitely create a very relaxing sound. 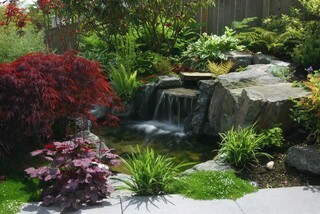 I would highly recommend this design to someone looking to add a waterfall to their koi pond or for a new pond construction. The oxygenation and circulation that these kinds of water features adds to the pond also helps to slow the growth of algae which many pond owners can tell you has saved them many dollars in maintenance. Pondless waterfalls are picking up in popularity and for good reason. 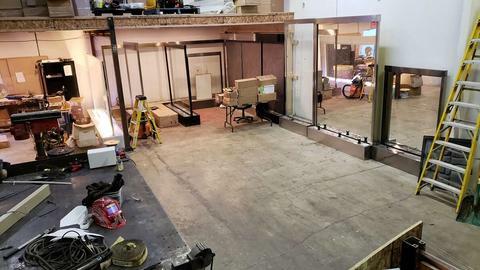 Many homeowners are embracing the DIY (do-it-yourself) movement, perhaps inspired by their favourite gardening shows on TV, and tackling some of their own projects. I’m sure you that are reading this hate the idea of having to pull rocks out of the pond, cleaning the pond out, then putting the rocks back in and so forth. If you are a landscaper being paid to maintain it I feel your pain. As an aside, should you decide to create your first waterfall using natural stone I highly recommend studying The Pond Digger on YouTube. He has shared many tutorials online to help home owners and contractors alike what to expect and some tips to get the most of a pond project. The guys over at Shehan are amazing and have taught us a lot about what it takes to make clients dreams become a reality. 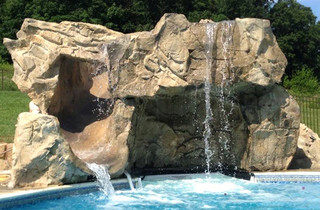 From using shotcrete to other faux rock materials, they are masters at creating custom waterfalls which also compliment their specialization in pools. Check out their website to view some of their award winning projects and brainstorm more ideas. Things to consider are the type of buyer that would be interested in your home. If they like the idea of having a pool then having a custom-made water feature by the poolside will get them excited about investing in the property. On the flipside we have seen many new homeowners have a pool filled in because they did not want one. Whether or not you should add a pool to the yard is something that requires a bit of knowledge of the surrounding area. It sounds simple but it is surprising how often builders forget to understand what type of buyer or demographic they are catering to. Sometimes the buyer doesn’t want or even care about owning a pool. Keep in mind that there are different options to choose from ranging from concrete, GFRC, paneling, natural rocks, fibreglass, or plastic. May require a permit which can be difficult to get if using heavy materials, drilling into natural rock, and so forth.